Running a marathon: impressive. Running an ultra marathon: incredible. Running four ultra marathons, each 250 kilometers (155 miles) in uniquely challenging desert terrain, in one year: that’s a level of physical and mental fitness most people can’t even imagine. Samantha Gash is one of less than 30 people in the world who doesn’t have to imagine this experience, because she lived it first hand. 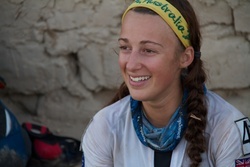 Gash was the first female and youngest person to complete RacingThePlanet’s Four Deserts Grand Slam in one calendar year. 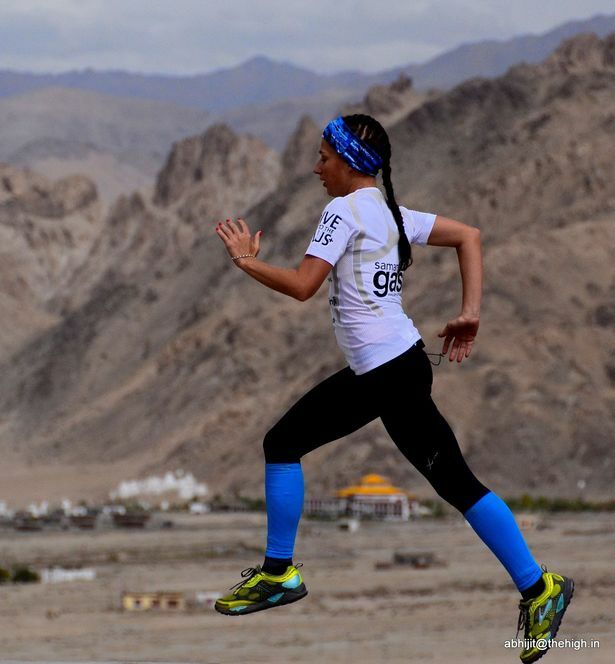 She ran four consecutive 250km ultramarathons; one in the driest (Atacama Desert in Chile), one in the windiest (Gobi Desert in China), one in the hottest (Sahara Desert in Egypt) and one in the coldest (Antarctica) desert on earth. A true symbol of determination and perseverance, Samantha Gash is a National Crusader for the League of Extraordinary Women, and featured in the new movie, Desert Runners, which chronicles this 2010 accomplishment. Whether you’re preparing for your first 5K, or ready to take your marathon running to the next level, Samantha Gash provides plenty of fitness inspiration. GoRecess: How did you first become interested in the Four Deserts Grand Slam? Samantha Gash: I think of it as an adventure. I like traveling, I love going to really unique places that maybe people didn’t go to as much, and I liked running. I definitely didn’t love running at that point, and I signed up for Four Deserts after I finished my first marathon. To complete my first marathon, I pretty much was dragged to the finish line by a friend, and that left me wanting to see what I could do both mentally and physically if I was by myself. So I thought, “Why not do a race on the other side of the world which combines a lot of other elements that I like, and I can just see how tough I really am, or how not tough I might be?” I was really intrigued by that. GR: After being “dragged” across the finish line of a marathon, how did you shift your training to be able to accomplish the 1000 KM feat? SG: I didn’t really know how to train, to be honest, for the first one. I learned along the way. You don't need to increase your kilometers in one sitting, so for the marathon the most I got to was 32 kilometers. What I would try to do, instead, is back-to-back runs. I would run maybe 20K on a Friday, 30K on a Saturday and do something else on a Sunday. 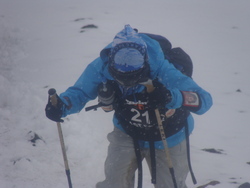 Because the races are self-supported, the biggest thing is to try and work out how to carry everything in a pack on your back whilst your doing it. So, for me, the running thing I knew would be challenging, but it’s every other thing that makes this a really hard adventure. Being self-supported. Being in a place that’s always sandy and always dirty, keeping yourself clean and your feet clean so they don’t get blisters. Those are the hard things. GR: Along the way, what were your greatest challenges? One of my tent mates gave me his sock, so I cut off the bottom part of the sock and used just the band and put that around the knee, because I didn’t have a stretch bandage or anything like that that I could use to add compression to my knee. GR: In addition to running, what did your cross-training program look like? SG: I tried to find ways to simulate the extreme components of each race. For the Sahara, I tried to prepare for the heat by doing a lot of Bikram training. When I was injured, I was doing a lot of deep water running as well. Going into Antarctica, I found a cool chamber so it’s a treadmill in a temperature modified room, and I was prepared for the cold. I wanted to test out my gear, but because there were only 3-4 weeks between Sahara to Antarctica, I couldn’t really train, so I just wanted to know the right amount of clothing to wear. GR: How did you know when you could push through that pain barrier and when you should just listen to your body and stop? SG: I think the thing is just self-awareness of your own body and being willing to listen to your body’s signals. Your body will tell you everything. I really believe your body knows what’s going on. Often the mind gets in the way, and tries to tell you you’re hurting more than you are, so I think you really have to have trust that your body will give you good signals. I definitely pushed harder than I would in training, or if I wasn’t doing a multi-stage race. What I learned really quickly from the first few races that your body is so powerful at adapting to its surroundings and circumstances, and what we think is normal in training in suburbia or our own environment; the level of normal is so different when you’re out in the desert. You can perform at a different level with your body being not at 100%. I think you know when you’ve done meniscus or ACL damage. It’s an acute pain, and I think your body can tell the difference. GR: What were some of your techniques for staying motivated when you hit that mental wall? SG: I always had really good companionship of people I met along the way. I think that distracted my mind from the pain, and also reminded me that everyone was in pain, and that it’s normal to be hurting. I think once you can accept that, that everyone else is in agony (laughs) and we’re all going through the same thing. Just like misery loves company, so does agony (laughs). I just think I really love the people I was racing with. The idea of pulling out and not being a part of that side of the racing was something I didn’t want to do either. At the end of the day, my “why” for being out there was so strong, that it would have taken a lot for me to pull out. GR: Do you have any advice for recreational athletes on how to set big fitness goals and work toward them? SG: I think with anything to do with fitness is that you can do whatever you want to do as long as you really want to do it. You have to find what you enjoy. For running, I always say that trail running is some of the most enjoyable times I’ve ever had running as opposed to road running. I think the mind is more occupied so you can maybe get in longer distances. For me, the road is a little monotonous. The surroundings on the trail are so beautiful. I think it’s always good to set a goal and then to find other people that have also set the same goal, because you will have a similar lifestyle. You can share resources and motivation, and keep each other on track. I think all of that kind of stuff is really helpful when you’re setting a goal. For me, that was a massive thing. When I was just doing my first 5K race, that was a huge thing to me then too. Find people that share the same passions as you. Be a bit strategic, and I think the biggest thing is, accept the fact that you are going to have setbacks at times on the way to your goal. As long as you turn that setback into a positive, I think you become stronger for it. I had plenty of setbacks. I think you learn so much more about yourself in the moments that you are struggling. GR: Do you think your experience was different competing in Four Deserts as a female than it would have been competing as a male? SG: As a woman, there were less of us out there. I do love being the minority sometimes. I think it actually drive me to keep going knowing that if I drop out, that’s one less woman that’s going to complete it. In fact, the completion rate of females in these tend to be quite high. I think females are quite adept at doing endurance racing because it becomes quite a lot about the mind. I definitely found that the females versus the men, in general, were better able to keep a sustained level of happiness throughout the experience. I made friends with the guys as much as the girls, but I did make some great companionship with a different female in every race. 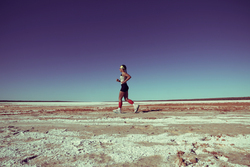 When I did start researching for Four Deserts, there wasn’t much information specific to females doing ultra marathon running. That’s definitely changing. There are some great blogs out there with endurance racers that are female giving advice. For me, I realized my nutritional requirements being an under 100 pound 5 foot female are going to be a lot different than a guy who’s 6’4” and weighs a lot more than me. Or even how to carry my backpack, which is going to be about 20% of my body weight. I found it hard to get information that was specific to my requirements, so I had to learn along the way. GR: What lessons did you learn about yourself by competing in Four Deserts? SG: The first one is that if I want something enough, I have the ability to make it happen. But if I didn’t want it, I would have had about a zillion reasons to push out, because you are in so much pain. The second one is that I really do rely on the strength and companionship of other people in these races. I like to buddy up with people. Not just for safety, but I’m a person that just likes companionship. We can be silent, but running alongside someone really feeds energy to me. The third lesson was about nutrition. During the race you eat stuff that you just normally wouldn’t eat. Dehydrated food. Ramen noodles. Everything that I don’t believe in nutritionally. So it was key for me as a pescatarian who is obsessed with fresh fruits and vegetables to dose my body with lots of good stuff leading up to it so I can, in a sense, abuse the body during the race. I think when you train for anything, whether it’s a 5K or an ultra marathon, your nutrition plays just as much of a vital role as your physical training. To see more about Samantha Gash and the Four Deserts experience, check out the movie Desert Runners that follows Samantha and three other athletes as they attempt to complete the most difficult desert ultra-marathon series on Earth. GoRecess users receive 10% off of movie purchase with the coupon code: gorecess.